So, before the clock ticks over to a new day and new year, here is my top ten for 2013 (a list that seemed to change each time I reviewed it because my year in books included numerous gems. In no particular order: The Round House by Louise Erdrich, All That Is by James Salter, The Death of Bees by Lisa O’Donnell, The Burgess Boys by Elizabeth Strout, The Ocean at the End of the Lane by Neil Gaiman, Transatlantic by Colum McCann, Harvest by Jim Crace, A Constellation of Vital Phenomena by Anthony Marra, A Death in the Family by Karl Ove Knausgard, Coal Creek by Alex Miller. (A Tale for the Tim Being by Ruth Ozeki was a late victim of the culling process as was Burial Rites by Hannah Kent and Flight Behaviour by Barbara Kingsolver …. I could go on and on). The following took out the minor awards (those in the main Top 10 were excluded from double-dipping) : Best debut book: Burial Rites by Hannah Kent. Funniest book: Love Nina by Nina Stibbe. Best book of Short Stories: Karen Russell’s incredibly imaginative and decidedly creepy collection Vampire in the Lemon Grove which just edged out Revenge by Ogawa. JANUARY: Astray by Emma Donoghue, After the Quake by Haruki Murakami, The Round House by Louise Erdrich, Ways of Going Home by Alejandro Zambra, Flight Behaviour by Barbara Kingsolver. FEBRUARY: My Hundred Lovers by Susan Johnson, The Twelve Tribes of Hattie by Ayana Mathis, The Last Runaway by Tracy Chevalier, Y by Marjorie Celona, The Deserted Newsroom by Gideon Haigh, We Live by Water by Jess Walter. MARCH: Cold Light by Frank Moorhouse, Six Shorts, The Finalists for the Sunday Times Short Story Competition, The Song of Achilles by Madeline Miller, Olive Kitteridge by Elizabeth Strout, Lamb by Bonnie Nadzam, The Golden Egg by Donna Leon. 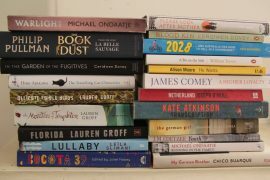 APRIL: The Light Between the Oceans by ML Steadman, One Thousand Pardons by Jonathan Dee, The Death of Bees by Lisa O’Donnell, The Burgess Boys by Elizabeth Strout, Beneath the Darkening Sky by Majok Tulba, Bonsai by Alejandro Zambra, Lost Cat by Caroline Paul. MAY: The Woman Upstairs by Claire Messud, All That Is by James Salter, Inferno by Dan Brown, Burial Rites by Hannah Kent, The Iron Man by Ted Hughes, A Delicate Truth by John Le Carre, The Rosie Project by Graeme Simsion, Talking to Trees by Alejandro Zambra, A Sport and a Pastime by James Salter. JUNE: The Astronauts’ Wives Club by Lily Koppel, Ali and Ramazan by Perijan Magden, Instructions for a Heatwave by Maggie O’Farrell. JULY: Weird Things Customers say in Bookshops by Jan Campbell, The Ocean at the End of the Lane by Neil Gaiman, Transatlantic by Colum McCann, Bad Monkey by Carl Hiaasen, The Stalking of Julia Gillard by Kerry Anne Walsh, The Chemistry of Tears by Peter Carey, Killing Fairfax by Pamela Williams. AUGUST: Mr Wigg by Inga Simpson, Harvest by Jim Crace, The Female Vision by Sally Helgersen, The Marriage of Chani Haufmann by Eve Harris, South of the Border West of the Sun by Haruki Murakami. SEPTEMBER: The Night Guest by Fiona McFarlane, Gotland by Fiona Capp, The Lowland by Lahiri Jhumpa, The Testament of Mary by Colm Toibin, A Tale for the Time Being by Ruth Ozeki, Enon by Paul Harding, The Luminaries by Eleanor Catton, No Place Like Home by Caroline Overington, The Woman in Black by Madeline St John. OCTOBER: Strange Weather in Tokyo by Hiromi Kawakami, Revenge by Yoko Ogawa, After Her by Joyce Maymard, The Good House by Ann Leary, A Marker to Measure Her Drift by Alexander Maksic, The Narrow Road to the Deep North by Richard Flanagan. NOVEMBER: The Two Hotel Francfort by David Leavitt, Love Nina by Nina Stibbe, Saints of the Shadow Bible by IanRankin, Tatiana by Martin Cruz Smith, Stay Where You Are and then Leave by John Boyne, An Officer and a Spy by Robert Harris. DECEMBER: A Death in the Family by Karl Ove Knausgard, A Constellation of Vital Phenomena by Anthona Marra, The Butler by Will Haygood, Silent Kill by Peter Corris, Coal Creek by Alex Miller and Vampires in the Lemon Grove by Karen Russell. I wish you all a happy, peaceful and fulfilling 2014. May your e-reader never break down, your bedside table never have less than three books lined up ready to dive into and may you keep supporting your local bookshops.